When spills, collisions, construction and nasty weather happen on BC highways, we need to tell you and others about them! But how can we do that when we’re out in the boonies somewhere on 46,000 kilometres of provincial highway, and there’s no cell phone service? Happily, in places without cellular coverage, our good old Ministry of Transportation and Infrastructure radio network is there to transmit details and keep highways safe and people moving. It allows us to quickly transfer information to the Transportation Management Centre (which operates the DriveBC information system), emergency responders, maintenance contactors, ministry staff, local governments and other organizations and individuals. This is our lifeline to managing the situation and letting you know what’s happening that could affect your travel. In the event of an earthquake or major disaster, the radio network would also be critical if cellular towers are destroyed or downed in an emergency. The radio network also comes in handy for some pretty dramatic rescues! An injured cyclist was airlifted from the scene of a collision last year, after our Radio and Electronics Section manager who happened to see the collision, radioed for ambulance and RCMP assistance. Our radio network has been in operation since around the 1970s and is essential in remote locations like Highway 37 in northwest BC, where it stretches about 560 kilometres from Meziadan Junction to the Yukon Border. Heckman Pass on Highway 20 is another far-flung place. The radio system is also called on (pun intended) in more populated regions, to serve in the roughly 40 to 50 kilometre-long “no cellular service” sections of highway between cities and towns. Our ministry and our maintenance contractor vehicles are all fitted out with radios that link to the network. 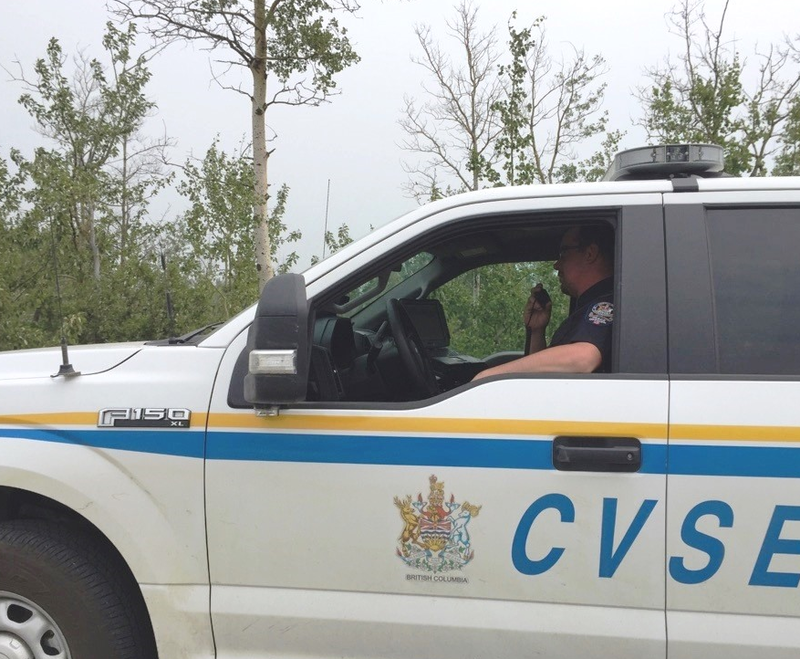 Commercial Vehicle Safety and Enforcement also use the radios, especially in remote areas, like up around Fort Nelson. We’ve also given special permission for the Lake Cowichan Volunteer Fire Department to use the system, along the Pacific Marine Circle Route. The route, once a logging road that is now paved, connects communities on southern Vancouver Island, and has long cellular service gaps. 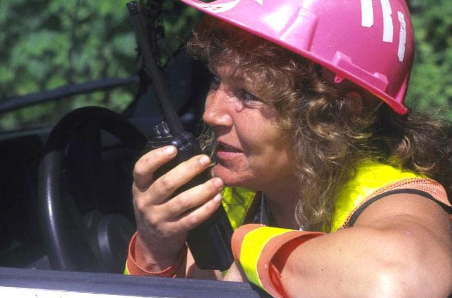 The radio system really shines in situations where widespread notification is needed. Multiple radio users can be connected to a single caller so that information can be shared simultaneously. (Kind of like a conference call – but by radio). Since 1993, the system has had the nifty ability to auto-patch through to telephones – landline or cellular. Two buttons to press and we’re connected! Radio repeaters, a combined radio receiver and radio transmitter, are a big part of the system and we have 188 of them. A repeater receives a weak or low-level signal and retransmits it at a higher level or power, so that the signal can cover longer distances. It links radio operators that are unable to communicate with each other, due to distance or obstructions. Communications technician uncovering a radio repeater tower. Repeaters are usually located on mountain tops to provide good radio signal coverage. A small group of technicians keeps the 188 signal repeaters in operation, and often technicians must helicopter into the site. While it’s warm and sunny in a valley bottom, repeater locations can be extreme – often well below freezing and windy, year-round. 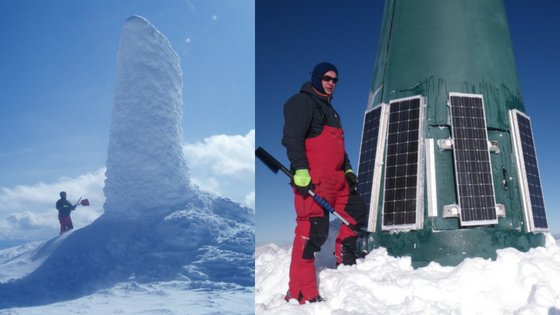 Our technicians dig into snow and ice to access radio repeaters, and scale ladders to reach the repeaters and antennae housed in big, green rocket-looking structures. The radio group also channels its talents toward identifying, testing and embracing new and better technologies. A big drive in electronics today is for devices that require less power – important when the energy source is solar. 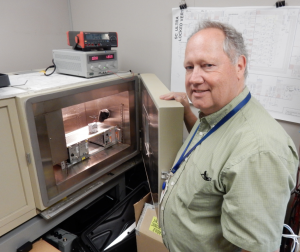 New components and devices are tested in our very own compact atmospheric chamber. Our staff place the device into the chamber, flip the “on” switch for the device being tested, close the chamber door, and set the temperature to -40C (or colder!) for about 48 to 60 hours. How the device fares helps determine if it will be adopted. Severe cold is notorious for causing batteries and electronics to malfunction, and parts to snap or crack. If the device survives and works as desired it may be used in future. If not, we continue on with current technology. Either way, with the radio network, we’ve got you covered. Good morning Randy – thanks for connecting with us here. Unfortunately, we cannot grant the public access to our radio system. The RCMP, BC Ambulance, Ministry of Forests, BC Hydro, conservation officers, BCParks, etc., all have the same policy. You can check with Innovation, Science and Economic Development Canada (ISED). They are the agency that looks after radio licencing across Canada. They may grant you authorization to use the LAD channels or resource road channels depending on your justification. Hope that this helps. My hat goes off to the radio network folks. I love our radio system and always state to new staff that the radio call book is the most important book in the ministry! The folks that keep this system functioning in our BC climate are totally amazing. Thanks for all your efforts in keeping our Province connected. We second that Hugh – thanks for your comment! I have worked extensively with your system all around the province and it never ceases to amaze me at what a powerful radio network we enjoy. A little startling that a lot of our staff have no idea how to utilize the radio system as we become very dependant on cell phone coverage. You guys are amazing – getting out there in the very worst weather and keeping us going and continually fixing a very complex system that we take for granted every day. Thanks for all the hard work – it is very reassuring knowing that you are there not only for our day to day work, but if and when there is a natural disaster we will still be able to carry on communications despite our dependence on a hardwired system that we depend on for phones. Unfortunately, we don’t give out this info due to the possibility some folks might program their own radios to work on our system. Industry Canada sets policy as to who is allowed to use our radio system based on our license and permissions granted by our group. Hi Jim – we aren’t sure what you mean by this comment. Are you asking how our radio system helped with a tanker incident in Rossland? Of the 46,000 km of Provincial highways, how many are not covered by conventional cellular service? One of our radio folks did a rough calculation. Based on the Telus coverage map, they estimate that about 6,400 km of provincial road are not covered. That’s if you believe the coverage map, there are a lot of places in North East BC where the map shows coverage and even with a cell booster it may or may not be possible to make a phone call. Data services are even more unreliable. Coverage maps are very general. There are numerous gaps in service within the areas shown as covered, but surprisingly, there can also be tiny spots where there is service in areas they don’t indicate coverage. Sadly, the newer cell phones just lose and regain service without any indication other than a little bar graph on their screens. The older cells beeped upon loss of service, and again when service was regained. That clearly identified the sportiness as you drove along. I miss that feature.